One of the best ways to get crafting this Halloween is to get started on a treat bag. Help your kids create spooky, silly, or sweet candy bags so you can leave the old pillowcases and dollar store plastic pumpkins at home. 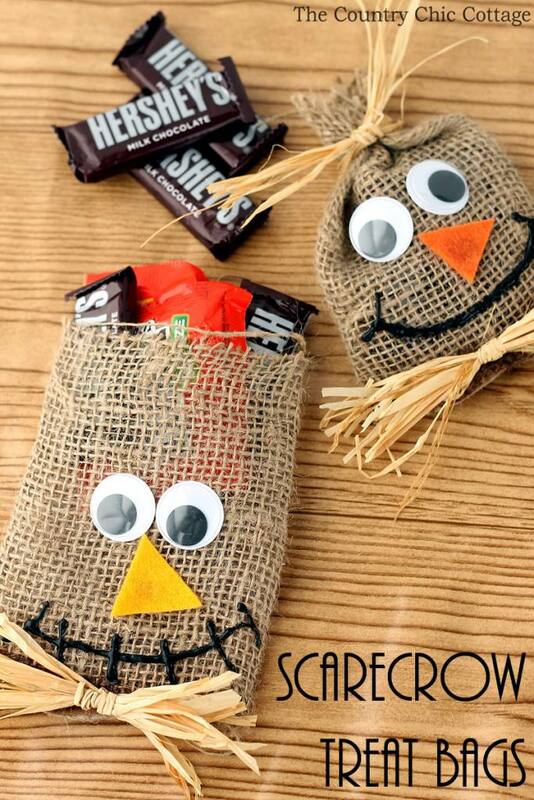 Scare off any potential candy-stealers with a spooky scarecrow bag. Made out of actual burlap and straw, this authentic and adorable treat bag also works well if you need to pre-package treats for a Halloween party. If you thought hearts were just for Valentine's Day, be sure to think again. This little design for a Halloween heart candy box is oh-so-cute. Make these ahead of time as Halloween handouts or filled with treats for a class party. This craft is beyond creative. Candy corn is such a great staple of Halloween and there's no better time to make an easy DIY candy corn bag. Felt works best to keep the cone shape intact through the night's festivities. This flamingo skeleton tote is so trendy, it's to die for! Keep Halloween chic, while maintaining some of the spookiness of the night, with a cute cut-out on an all black tote bag. This is a great trick or treat bag for tweens who want to keep the magic alive while still staying cool. It's so on trend, you can use it beyond Halloween. A trick or treat bag that doubles as chic Halloween home decor? Yes, please! Use an actual dried out gourd and some spray paint to make this super creative golden gourd Halloween basket. Here's an old crafting stand by: duct tape. Upcycle some empty tins by using duct tape with Halloween themed patterns and colors and create some really impressive duct tape treat buckets. One of the more underrated Halloween motifs—black cats—are so cute and perfect for crafting activities. You won't be unlucky with this adorable felted black cat treat bag. A no-sew bag is an easy activity for little hands. Avoid the need for needles and have fun with the whole family making these cute felt bags in festive colors and patterns. Hairy, scary fun! We're head-over-heels for this "Cousin It" trick or treat pail. It's especially fun if you pair it with a whole Addams Family themed costume! If needlecrafts are your go-to, this crochet pumpkin bag is the craft for you! Crotcheting is such a good fall activity, and if you're already working on hats and socks for the season, just add this to the list! This is a great trick or treat bag for especially little ones since it's so soft and durable. Spooky and sticky, this bag is great for any lovers of creepy-crawlies you may have in your household. With just some fabric for a basic bag design and some velcro, you can elevate a standard candy bag to a quirky and cute sticky spiderweb treat bag. Patterning is such a fun way to craft. This spooky eyeballs treat bag takes a simple pattern and makes it Halloween-y. If you're having trouble finding the exact fabric used here, feel free to find something similar. There are plenty of patterns easily upgraded to Halloween style with just a few googly eyes. This little sewing project makes for an adorable homemade drawstring bag. Your kids will use it year after year. Check out your local fabric store around October for some fun and seasonal patterns. This is a sweet item to keep once your kids have grown up and out of trick or treating. It will remind you (and them) of fun trick or treating memories.